It looks like the inFamous franchise may take the multiplayer plunge. VideoGamer reports that an official PlayStation 4 brochure features a page on the upcoming launch title inFamous: Second Son, listing the game as supporting a single player offline and “online players TBC.” If true, Second Son will be the first inFamous game to implement a multiplayer mode. VideoGamer notes that other single-player titles detailed in the brochure don’t mention online players at all, which may confirm Second Son’s status as a multiplayer title. Developer Sucker Punch has yet to confirm or deny a multiplayer mode for Second Son in any way, shape or form. If the report is to be believed, inFamous would join a growing number of franchises that started out as strictly single-player affairs but added multiplayer with later installments, with mixed results generally skewing toward positive – the Mass Effect, Assassin’s Creed, God of War and Uncharted franchises, to name a few, have already gone in that direction. The first inFamous had no online component to speak of, but inFamous 2 featured a mission creator in which players could upload custom-made adventures into the game. 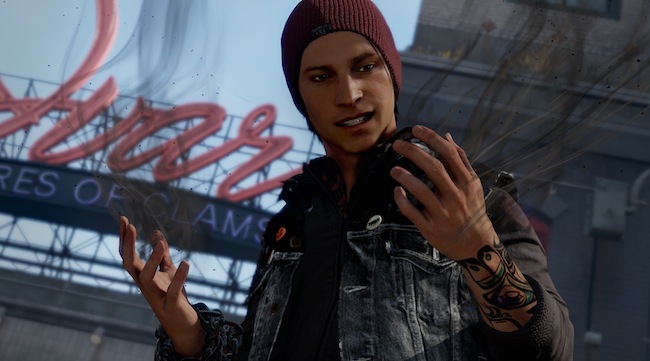 inFamous: Second Son is the third game in the open-world action-adventure franchise, and the first not to feature Cole McGrath, the protagonist of the first two entries, as a playable character. Instead, players will take control of new hero Deslin Rowe, whose powers are primarily smoke-based, in contrast to McGrath’s electricity-based abilities (though as in inFamous 2, the power-set will expand as the game progresses). Second Son is also the first game in the series to be set in a real-world location, with the action taking place in a locked-down Seattle. inFamous: Second Son will launch on the PlayStation 4 in early 2014. What do you think of the possibility of inFamous multiplayer – A solid addition to the franchise or a big mistake and why? Let us know in the comments.